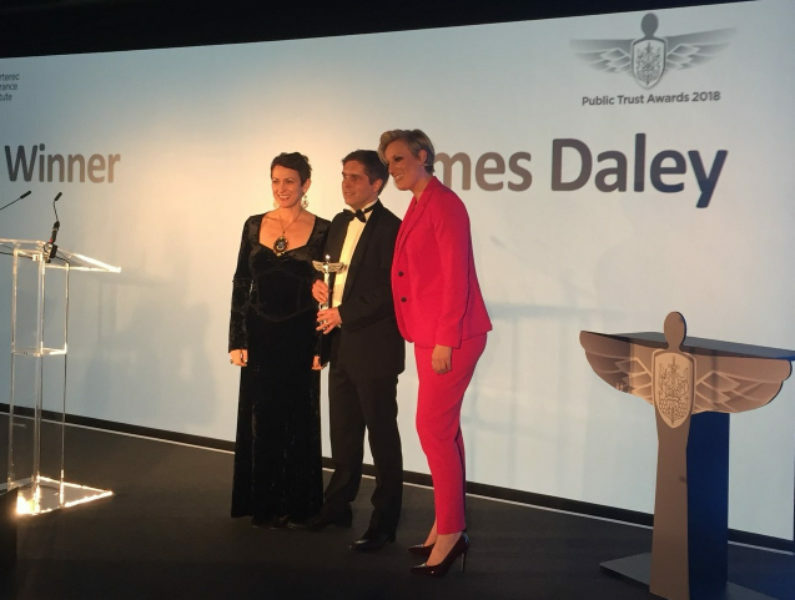 Last night, I was honoured to be given the consumer champion award at the CII's Building Public Trust awards. This is the speech that I very nervously delivered to a packed room in the Lloyds of London building at 1045pm. Madam President, Ladies and Gentleman – I’m incredibly honoured to win this award, and I want to thank the CII for recognising the work of organisations like ours. I set Fairer Finance up four years ago for the very same reason these awards were established – to build public trust in financial services. I understand I’ve got three minutes of your time this evening, and I hope you’ll indulge me in listening to my diagnosis of why trust is lacking, and what we need to do to change that. I'm quite relieved that Steph (McGovern, the host for the evening) just made you all hug the person next to you. The next three minutes will certainly be less uncomfortable than that. Over the last 18 years, I’ve worked as a journalist, campaigner, researcher and consultant – a range of roles that I think have given me a unique perspective on this industry. I confess that when I started out as a newspaper reporter, conspiracy theories were intoxicating. Back in those days, I may have genuinely believed that insurers were run by bald Bond villains stroking cats. But since I set up Fairer Finance, I’ve had the opportunity to work within many of the market’s largest businesses, and I’ve seen first hand that the people in this industry have integrity and pride in their work. But organisations – like humans – are adept at the art of cognitive dissonance: holding multiple opposing views at once. In most of the companies that I have worked with, everyone tells me that the customer comes first. That they’re in the business of paying claims. Yet, for most of these companies, I can pull up dozens of Ombudsman cases that point to a lack of humanity and empathy when it came to the moment of truth. These decisions aren’t made because the individuals who work in the business are callous. But insurance is all about rules and lines that can’t be crossed. And while those who work in the market see those boundaries very clearly – they often feel arbitrary to consumers and are completely out of kilter with their expectations and needs. Narrowing this gap between expectations and reality is the key to repairing trust between consumers and insurers. Customers need to be able to walk from claims experiences feeling they were treated fairly – regardless of whether the claim was paid or not. And insurers need to be able to break away from making decisions entirely based on rules and statistics. They need to unlock empathy and discretion in their organisations. Last week, someone emailed me with a story of how their insurer had rejected a claim when their house burnt down. The house had 5 bedrooms – and 2 attic rooms which had not been completed according to buildings regulations. When the house burned down, the insurer told the customer that his house had 7, not 5 bedrooms, and because they didn’t cover 7 bedroom properties, they wouldn’t pay a penny of his claim. Worse still, the Ombudsman agreed. By the letter of the law, and the rigidity of the policy document, the insurer might be right. But the stakes are too high to turn your back on customers in these circumstances. If the industry wants to rebuild trust, it can’t hang customers out to dry on a technicality. A £60,000 claim for the insurer might be a little painful – but for the customer, it may be life changing. And that customer will spend the rest of their days telling everyone who will listen why insurers are not to be trusted. Although these cases are not typical, they are the ones that continue to give the industry a bad name. There’s no use talking about the 90% of claims that are paid. Insurers need to ensure that fair outcomes are delivered every time – regardless of whether there is a clause in the policy document that provides a way out. Building empathy and flexibility in the insurance market requires cultural change. That is not just a buzz phrase, it’s about changing the way products are designed, decisions are made, communications are written, risk is assessed and staff are incentivised. We’ve worked with a number of businesses that are up for the challenge. And if the rest of the industry can follow, I believe we will finally have some foundations on top of which we can start to rebuild public trust. Thanks again for this award. And enjoy the rest of your evening.